Myelocytosis, an increase in transitional B cells, and the absence of marginal zone and memory B cells are hallmarks of the patients’ phenotype. (A) Pictures of blood smears from P1 and P2 after staining with May-Grunwald-Giemsa reagent, showing the abnormal presence of myelocytes. Original magnification, ×100. (B) Distribution of the different myeloid cell populations in the blood of both affected siblings. Each circle (P1) or square (P2) denotes an independent blood sample. n = 2. Pro., promyelocytes; My., myelocytes; Meta., metamyelocytes. 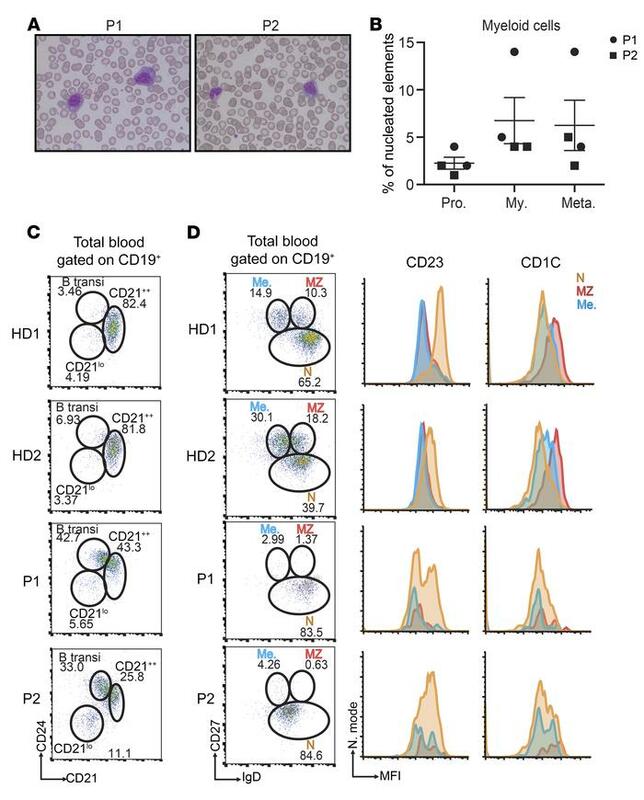 (C and D) Representative FACS plots analyzing the frequency of transitional B lymphocytes (C), marginal zone, memory, and naive B lymphocytes (D) in the blood of 2 healthy donors (HD1, HD2) and both patients. These experiments were performed 3 times. transi, transitional; Me., memory; MZ, marginal zone; N, naive.